A convenient daily oral vitamin D spray containing 3000iu`s per dose to aid bone and teeth health, support the immune system and combat vitamin D deficiency. This spray is suitable for vegetarians and contains 100 sprays. Vitamin D (for humans this is D3) is essential, along with magnesium, to absorb calcium. Without D3 and magnesium, calcium is simply not soluble. It will not enter our bones and settle in the soft tissues around our joint, in our muscles and in our blood cholesterol. Calcium is very good for us but only if we can absorb it. Vitamin D3 is a fat soluble vitamin, so BetterYou have developed the D Lux 3000 to be oil-based (using natural sunflower oil) in order to increase the retention within the body. By applying it directly into the mouth, ideally under the tongue, it is absorbed directly into the blood system rather than having to be processed by the digestive system and major organs. This ensures no loss during the absorption process. The solution has been micro emulsified to ensure the particle size is optimal for absorption in this way. Use 1 spray a day (pack contains 100 sprays - so 100 days use). 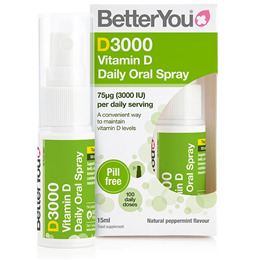 Below are reviews of BetterYou DLux 3000 - Vitamin D Oral Spray - 15ml by bodykind customers. If you have tried this product we'd love to hear what you think so please leave a review. Saw this recommended in a newspaper. It is better than tablets I have taken for years from the doctors. It works better and does not upset your stomach. Recommended by my physio, cheaper than my local store, tastes good and hoping it's doing me good! Wonderful product, easy to use and suitable for permanent Vitamin D supplement - which is what my GP recommends in Scotland. As always very good service and delivery and I always take Dlux 3000 every winter plus some other supplements from you and so far have escaped colds and flu. I have used this product for a long time but I'm not sure if it be better with drops or supplements. First class mail order service and delivery. Product is pleasant and easy to use and a good price. Great, easy to use product, good taste, the kids take it as it's easy and keeps their D levels topped up. Nice product and tastes good. Nice and easy purchase/delivery. This product is easy to use rather than drops. I trust it will be the answer to the lack of sunshine. Good portable product that can be taken anywhere you go. Liquid is so much more easily and efficiently absorbed by the body. So simple. Does go off if you don't use it quickly enough so I give myself two sprays a day 6000 iu which I think I need. Will always use this product as my vitamin D levels are not fantastic. Never going to be as good as good old sunshine, but better than nothing considering our UK climate and I have dark skin. With lack of vitamin D being linked to cancers I definitely want to watch my levels. Recommended. Great product and used this for a few years now as being diagnosed with a vit d deficiency. I use this in winter months and switch to the 1000iu during summer months. Recently purchased for my father who has some health issues. Easy to take. I also use the magnesium spray in this range too. Easy to use, much handier than capsules I had previously been prescribed by my doctor. Easy to use and the taste is not unpleasant - very happy with it. Amazing product. I TOTALLY LOVE IT!!!! :) My vitamint D was really low despite the fact that i come from a really sunny island. I used to take supplements as pills but nothing happened. When i started taking this product my last blood results showed that the level of my viamint D is high. I recommend it for sure!!! Absolutely love this product! I have been using it for approx 12 months and definitely cannot complain. A very efficient way of ensuring I receive the vitamin D I require, I opted to use this product after researching the best absorption for taking vitamins as historically I have taken tablet form and not noticed much of a difference. Lovely taste and super easy to use!! I recommended this product to my mother also as she has multiple sclerosis - she is also an avid fan! I would definitely recommend this product and will not purchase any other! Excellent product, have one for all the family to keep us all topped up. So convenient & easy to use. Love this product. Easy to use. Lovely refreshing taste. I've used this product for many years, and find it a very good way to take my d-vitamin supplement as a "cure" for a limited time, it is great tasting and so easy to use, I don't like swallowing pills. Very convenient having Vitamin D in a spray. I have trouble swallowing pills so this is great. I had very low Vit D a few years ago, (as many of us do) after trying a few Vitamin D's, I found this one which has a high level. I had to take 3 or 4 sprays to get my levels up as I have absorption issues - but D3 form of Vitamin D - and sublingual - gives you the best chance at absoprtion. You really should take D3 with K2 - but the other sprays do not have as natural ingredients as this one which is very important to me. I have bought this spray for years, along with other 'betteryou' products, (such as the magnesium flakes) as it is a trusted range for me; I know it works. A very easy way to administer vitamin D to all the family that is reasonably priced. It was recommended to me by my GP and has ensured that we now have normal vitamin D levels which previously we didn't. I buy this product regularly. Having previously purchased this product from Bodykind, I was offered the opportunity to receive a further product free of charge in return for writing an honest and unbiased review, which I have done. As I have been diagnosed with heart disease (to my surprise as I thought I had the heart of an ox! ), I learnt that Vitamin D3 is necessary for heart health. I find it very easy to use, good high strength and good price. I shall continue to use it and would recommend it to other cardiac patients. Amazing products! Spray delivery the future for supplements? 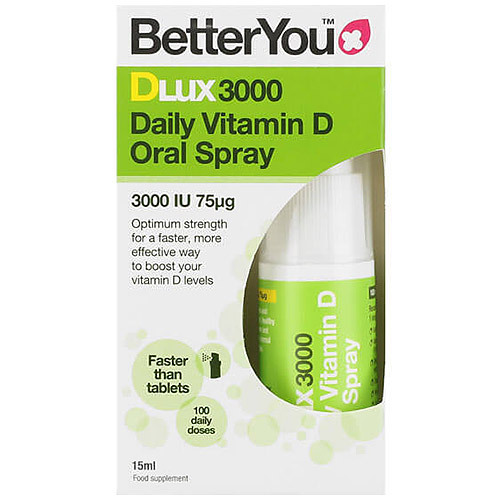 BetterYou DLux 3000 is a convenient daily oral vitamin D spray containing 3000iu`s per dose to aid bone and teeth health, support immune system and combat vitamin D deficiency. Suitable for vegetarians. Peppermint flavour. Contains 100 sprays.